Websoftex Provide a online web based Patsanstha Software built especially for Patsanstha with automatic posting of business data to accounts module. Websoftex is a .NET based centralized database online software for Patsanstha with banking operations such Fixed Deposit, Recurring Deposits, Daily Deposit Schemes, Loan to Customers, Monthly Income Schemes, Dividend declarations etc. Websoftex handles the Members details. Saving A/c, Current A/c, FD A/c, RD A/c, DDS A/c. Management of Pass book and Bond. All kind of Loan operations, Printing Loan Ledger, Automatic Interest Calculations. Websoftex has integrated General Accounting Module with Cash-Bank Book, Journal Entries, General Ledgers, Trial Balance, Day Book, Fix Deposit, Profit and Loss Statement, Balance Sheet etc. Fully secured database with role based security implementations. Websoftex Provide Mobile Application as customer requirements for Daily Collection and other solutions. We are a company which is well known in the market among the customers for the high range of software services which we offer to the clients for a range of services as per the requirements of the clients. The Patsanstha Software which we offer to the clients is very efficient and reliable. These services are made available to the clients at very reasonable rates and they are high on demand in the market among the customers. Our software includes all analysis of total deposit, daily transactions, loans etc. It provides accurate information at a press of button and reduces paper work and generates balance sheet at the same time. 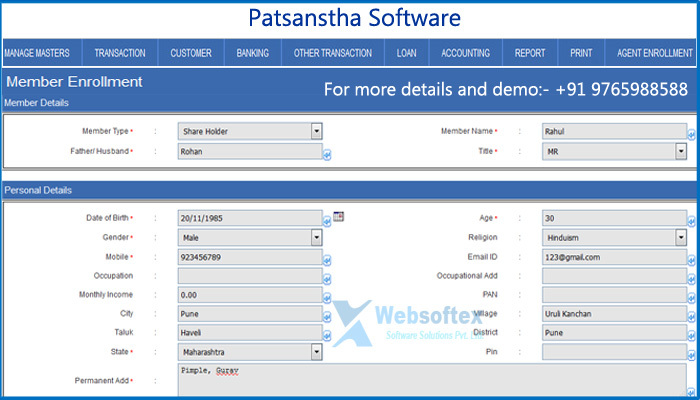 Patsanstha Software to makes accuracy in all Transactions & also provided Ping me Facility to the Customers.